If you thought curling was an amusing Olympic sport, you probably haven’t seen ski ballet. Ski ballet, a hybrid of figure skating and gymnastics on the slopes, made its Olympic debut as a demonstration sport at the Calgary Games in 1988. At the 1992 Winter Olympics in Albertville, France, ballet remained in the demonstration category while other freestyle skiing disciplines — moguls and aerials— got a full medal status. By 1994, the sport still failed to catch on and was dropped from the Lillehammer Winter Games entirely. Ski ballet recently got some buzz on social media when The Guardian shared a video clip of athletes clad in tasseled spandex costumes and dancing to synthesized music. “Bring back ski ballet – a tribute to the lost winter discipline,” their post read. Twitter liked the idea. According to Jeff Chumas, who competed as an aerialist from 1976 to 1980 and became the director of the United States freestyle ski program from 1985 to 1995, ski ballet didn't become a medal sport because of poor funding. “In the United States, and under the direction of the United States ski team, we were fighting for precious few resources against very well established sports like Alpine skiing, Nordic skiing, and the like. Freestyle skiing was not clearly understood back in those days," Chumas said. 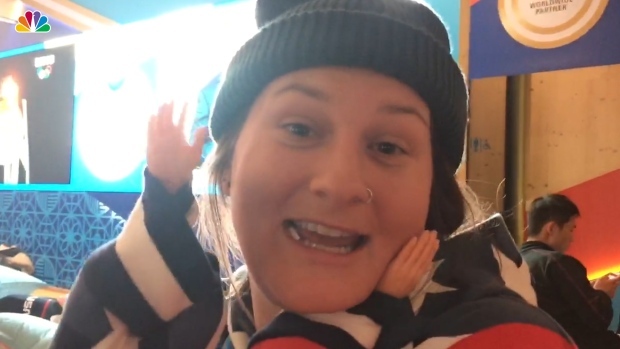 Followers of U.S. freestyle Skier Devin Logan have probably seen short videos of Logan carrying tiny doll hands. Ski ballet requires incredible strength and balance from athletes who ski down a smooth slope while combining jumps, flips and spins. They use shorter skis with longer poles and are judged on a combination of technical and artistic factors. Hannah Kearney, who won a gold medal in 2010 and a bronze medal in 2014 in mogul skiing said the eight years she spent doing ski ballet while growing up gave her the tools to be successful in moguls freestyle. “My success comes from the heart of the sport which is that you had to recover at all costs, be really strong, well balanced but also agile and light on your feet,” Kearney told NBC Olympics.